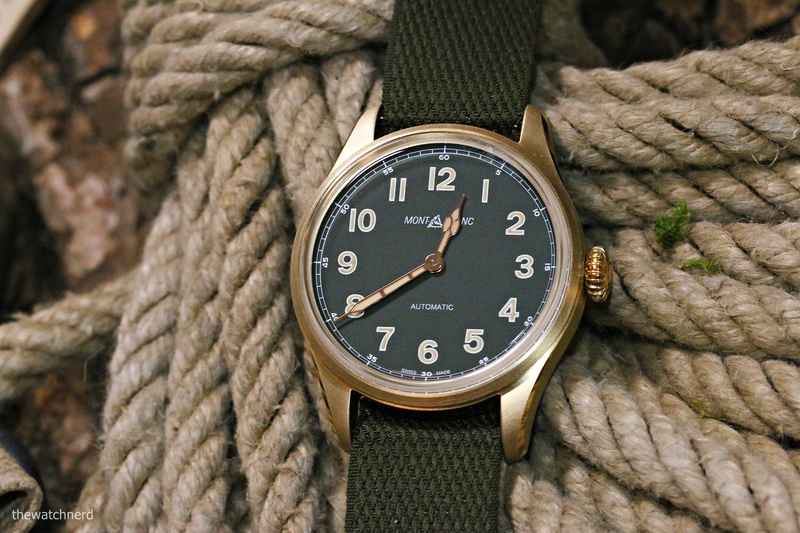 This was originally intended to be a post focusing on what for me is the most interesting of Montblanc’s 2019 releases to date, but there was a change of plan, so you are getting four bronze watches instead of one. The original ‘one’, as it were, will make its appearance as the finale piece. The 1858 Collection was introduced as a modern take/ tribute to Montblanc’s own history and that of the Minerva manufacture. In 2018, the brand introduced some new models to the collection family, including the 1858 Automatic, the 1858 Chronograph, and the 1858 Geosphere. This year, Montblanc have turned these three into bronze variants with khaki-green dials. What the new models share in common apart from the case material (water resistance is 100m) and dial colour/ design (beige numerals, red-gold cathedral hands with Super-LumiNova, vintage Montblanc logo), are the khaki-coloured NATO-style straps, bronze-coated titanium case backs engraved with a ‘Spirit of Mountain Exploration’ design, and a limitation number of 1,858 pieces for each of these new pieces. Rather than start with the most basic model, let’s start with the most complex. You can read about the 1858 Geosphere in this post. 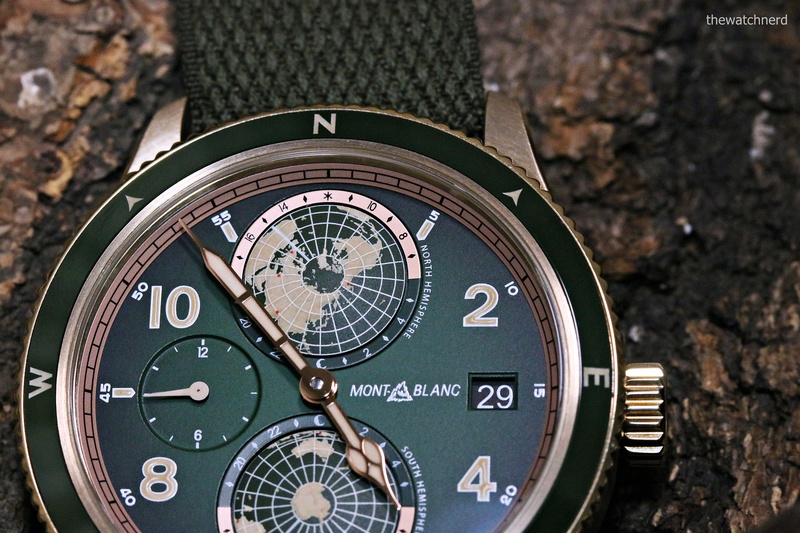 It is Montblanc’s wristwatch dedicated to the Seven Summit challenge, in which participants have to climb the highest mountains in each of the seven continents. On the Geosphere, this is noted by means of rd dots on the hemispheres to mark each mountains. The rotating bezel marked with compass points provides another link to the exploration theme. The 2018 piece had come in two iterations – a 42mm (12.8mm thick) stainless steel model, and a limited edition (1858 pieces) titanium-bronze cased version, both with black dials. Now, you can have it in a bronze and khaki-green variant. The 42mm case, water resistant to 100m, has a bi-directional bronze bezel with green ceramic insert marked with the four main compass points. The khaki-green dial features beige Arabic numerals, red gold-coated cathedral-shaped hour and minute hands, beige time zone hand, and a vintage Montblanc logo at 3 o’clock. There are two domed rotating hemispheres which rotate fully every 24 hours. The northern hemisphere at 12 o’clock turns anti-clockwise, whilst the southern hemisphere, at 6 o’clock, turns clockwise. They are both surrounded by a scale with the 24 time zones in contrastign colours (dark green for night, bronze for day), along with a day/ night indication. The longitude reference meridian for both hemispheres is highlighted by a beige line coated with Super-LumiNova, but there are no indications for cities. A second time zone display is on a sub dial at 9 o’clock, and the date, linked to the local time, is at 3 o’clock. Along with the date window at 3 o’clock there is also a second time-zone display is situated at 9 o’clock. Inside is the automatic Calibre MB 29.25 (Sellita base, to which a world timer complication developed by Montblanc has been added), with a power reserve of forty-two hours. Limited to one hundred pieces, the RRP is 6,300 USD. Next we have the new 1858 Automatic Chronograph. It comes in a 42mm bronze case and is powered by the automatic Calibre MB 25.11 (Sellita SW500-1 base), which has a power reserve of forty-eight hours. The watch displays hours and minutes from the centre and has a bi-compax design, with the seconds in a sub-dial at 9 o’clock, and a 30-minute counter at 3 o’clock. Old-school looks (especially the pushers) in a new-school form, with an RRP of 5,000 USD. Finally, the third piece in this new mini collection. The original 1858 Automatic was bi-metal, featuring a stainless steel case with a bronze bezel and champagne-colored dial. This has now been bifurcated into two watches, a limited edition one with a bronze case and khaki-green dial that is in today’s post, and a general unlimited version with a full stainless steel case and a black dial. This time-only model is 40mm in size (11.07mm thick) and uses the automatic Calibre MB 24.15, which is based on the Sellita SW200-1 and has a power reserve of thirty-eight hours. The RRP of the bronze model is 3,050 USD and the stainless steel one is 2,410 USD. Now we get to final piece, which was arguably the best value complicated watch released by Montblanc at the same fair – the 1858 Split Second Chronograph in bronze. The case material (and size) notwithstanding, its ‘looks’ are like the pieces from which it draws its influence. The traditionalism in it extends to the rattrapante movement, which is derived from the Minerva calibre 17-29 pocket watch movement of 1929. As I briefly alluded to earlier, as is standard for the 1858 line, the dial is retro-historical and influenced by the Minerva wristwatch chronographs of the 1930s, but in this model perhaps even more so for this watch than previous 1858 chronographs such as the 2016 Tachymeter or last year’s green one. The 1858 Split Seconds has a deep black dial with gilt hands, red seconds, snail tachymeter and telemeter scales, and faux vintage-coloured Super-LumiNova on the dial and hands. It is a monopusher split-seconds chronograph i.e. start/ stop/ reset functions for the chronograph functions are performed by a single button at the crown. The button for the rattrapante/ split function is at 2 o’clock. Attractiveness of the dial aside, it is powered by the manual-wind Calibre MB M16.31, which you can see through the open case back. 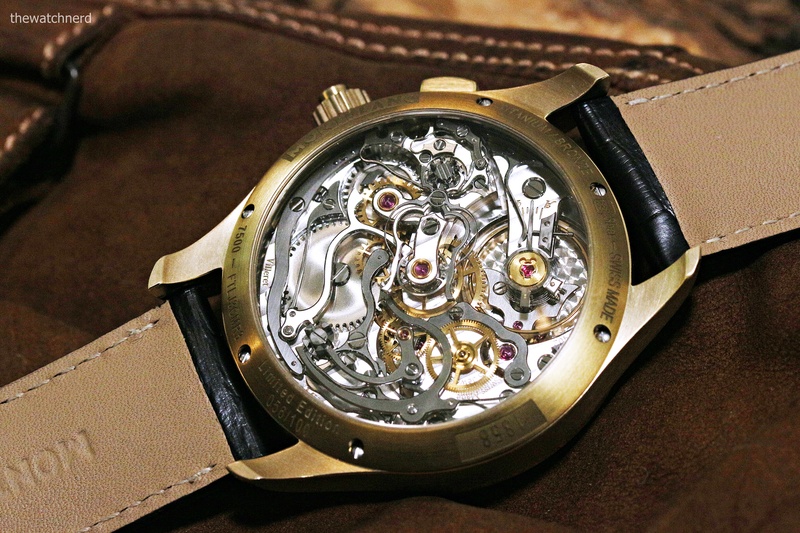 It appears to be the Montblanc calibre M16.29, to which they have added a rattrapante mechanism. It has a combination of perlage, anglage, Côtes de Genève, and brushed and mirror polishing. Beating at 18,000VPH, its power reserve is fifty hours. The diametre of the Cal M16.31 is the same than the 16.29 (38.4mm), but the extra mechanism means more thickness, so it is now 8.13mm (versus 6.30mm). This has resulted in a large watch, with the case 44mm, and 14.5mm thick. Bronze cases are not for everyone, and there may be some who chafe at the combination of this movement with this dial, these functions, and a thoroughly modern case material. But this is a good looking watch with its own character and modern charm. For those who want some historical chronograph and Minerva nods but in a new form and are okay about the 44mm size, this just might be for you. Limited to one hundred pieces, the 1858 Split Second Chronograph Bronze has an RRP of 32,500 EUR (including tax).